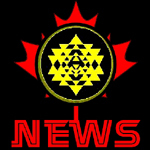 February 2001: I have been named the Eastern Canadian Representive of the Battlestar Galactica Fanclub covering Ontario, Quebec, Newfoundland, New Brunswick, Nova Scotia and Prince Edward Island. You can contact me (Kelly Stewart) at cangalactica@hotmail.com for more info. "Boxing Day" 2000: Space is showing a six hour marathon of the fans favorite episodes. Episodes shown: 'Saga of a Star World' (pt 1,2,3), 'The Return of Starbuck' & 'The Living Legend' (pt 1&2). Fall 2000: Check out the new Radio Shack ads with Teri Hatcher. If you check out the TV's in the background, they have Battlestar Galactica playing on the TV. "Space" has a new battlestar galactica page. Summer 2000: Revival efforts continue...The Sc-Fi network has expressed an interest in starting a new BG series for the network. Universal studios continues to drag their feet on a commitment to anything to do with BG. Meanwhile the original series plays on "Space" up here to great success. 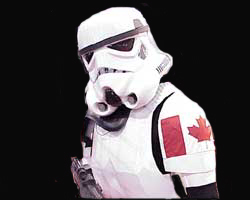 a Canadian stormtrooper shows its support! March 7th 2000: Canadian actor John Colicos died to today in Toronto at age 71. Best know for playing "Baltar" on Battlestar Galactica and the first Klingon on the original Star Trek series. February 2000: Space is now showing Battlestar Galactica regularly Saturday's at 6pm (EST) repeat is the next morning at 9am (EST). They are advertising it as "See how the future will look like the seventies!". January 2000: We won!!! Space: The Imagination Station (Canada's sc-fi network) will finally air something from the Battlestar Galactica universe. It will air Saturday January 8 at 6 PM ET (repeated Sunday January 9 at 9 AM ET.) They are promoting the event as a "mystery series" and not saying what it is exactly . -Richard Hatch's newsletter for June/July is now posted. -A press release was put out in response to the Glen Larson movie news from Richard Hatch/Su Shane Productions on March 16/99. Read it here. as a means of cutting costs. confident the world is ready for Galactica to conquer the box office. fan base, and enormous potential to be a successful motion picture." arrives in theaters this Friday. -"Battlestar Galactica: 2nd Coming" is being wrapped up but will not be available for fans to see but their is a "making of" that will be available at conventions this summer. (Most likely be in Canada at "Toronto Trek" this summer.) The film is approx 4 minutes long and will be available to film producers only. 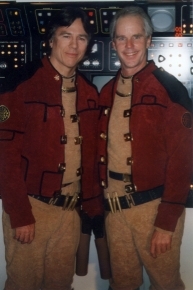 Hatch and Stauffer on the set of "BG: 2nd coming"
-Universal has plans to release "Battlestar Galactica" (the 2hr feature) on DVD, May 11th/99. -a trailer for "Battlestar Galactica: 2nd coming" was shot. This was done as an "audition" tape for studio executives to get a better idea of what the new series would be like. This I believe is the first real sign of Universal taking the revival seriously. -"Warhawk" Book 2( in a series of 3) by Richard Hatch is released bringing up to speed the Galactica universe 20 years. -20 YAHREN REUNION was held in LA on Sept 4, 5 & 6th to great success.